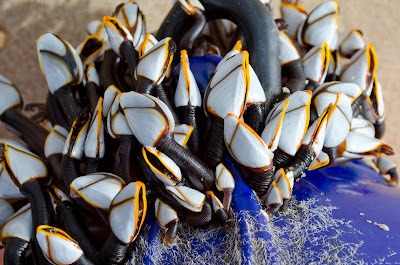 Gooseneck Barnacles. Click to enlarge. 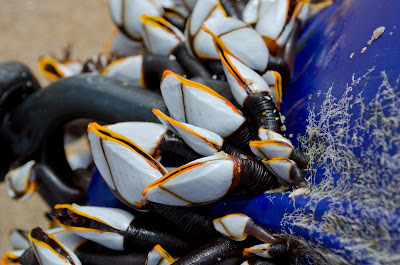 I was walking around the tip of Cape Henlopen in Lewes, Delaware last week when I came across the prettiest thing I have ever found on a beach -- a bunch of gooseneck barnacles. Barnacles are filter feeding crustaceans that attach to rocks or flotsam in the marine intertidal zone. These were attached to a floating marker that had broken its rope -- a bright blue and orange rigid plastic ball that said 29. I expect that when the tide came back, float 29's gooseneck barnacle community went back out to sea. As surprising as it now sounds, in ancient times these barnacles were thought to be the immature stage of a bird called the barnacle goose (Branta leucopsis). The shell and stalk kind of resemble the head and neck of a white-faced goose, right? Barnacle geese migrate to Britain and Ireland to overwinter there, but they nest elsewhere. Once upon a time, finding no nests, eggs, or chicks, people concluded that the birds grew from gooseneck barnacles until fully feathered and then sprang out of the sea. Very imaginative!